I received this 7" in the mail to check out along with a note saying it was being sent to me because I had reviewed The Rutabega album. That immediately intrigued me, but I did temper my enthusiasm as the note went on to describe the band as being an instrumental band. Even at their very best, I have a hard time with instrumental bands. I'm not sure what it is, but unless you are The Minibosses or someone else doing some pretty spectacular shredding, chances are I'm probably going to end up getting bored. 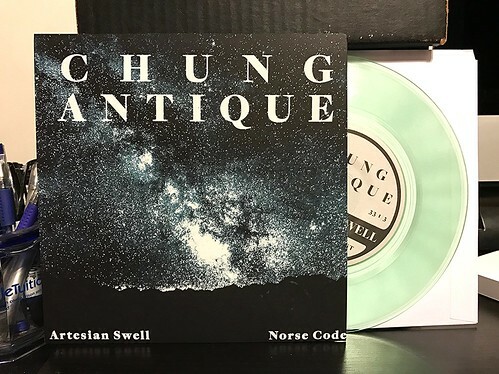 Unfortunately, that's exactly what happened with this 7" from Chung Antique. Nothing about it is inherently bad, as far as instrumental bands go, but I'm just left not totally understanding the point of it all when the songs are finished. Both clock in around the five minute mark and both kind of feel like they just go on forever. There's nothing particularly interesting going on, it tends to be a handful of riffs repeated over and over. The songs themselves are a bit mathy and makes me think of some of those old midwest bands like Karate or perhaps NYC's Turing Maching. I suppose if you like bands like those, this will probably be more your speed than it is mine. For me, they're just a couple of really long songs that meander around for a while.